Two Msgr. 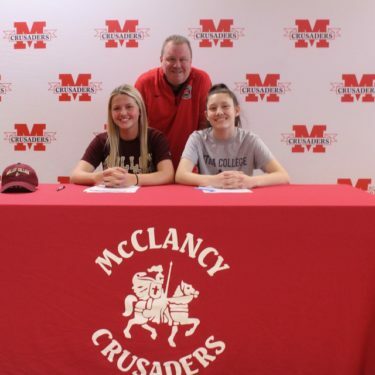 McClancy H.S., East Elmhurst, senior girls’ hoops players, Kaitlyn Stenz and Kim Soriano, are all set to continue their education and basketball careers in college. Stenz, a forward and team captain, is heading to Molloy College, Rockville Centre, L.I. Stenz and Soriano, right, are pictured with their head coach, Dewey Hopkins. She was a three-time Tablet All-Star in 2015, 2016 and 2017 who averaged 9.5 pts. and 7.4 rebounds per game her senior season. Soriano, a guard and also a team captain, will be playing at Utica College, N.Y. She was a 2017 Tablet All-Star after averaging 7.1 pts. per game this season and leading the team with 38 three-pointers.